Inclement weather notwithstanding, villages in Kharar, Majri and Dera Bassi blocks witnessed an overwhelming response to the panchayat elections, which concluded here today. Each teaching department of Panjab University will display the list of candidates who run short of the minimum required attendance every month on the notice board in the forthcoming academic session. The Delhi Government’s recent decision to offer 2 per cent concession in stamp duty to women buyers on the purchase of property has generated a lot of curiosity among real estate circles. 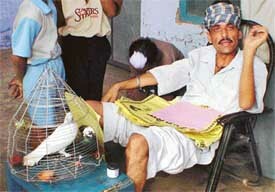 A section of people here also feel that the Chandigarh Administration should follow suit. A squall accompanied by rain hit the city today disrupting power supply to most parts of the city. 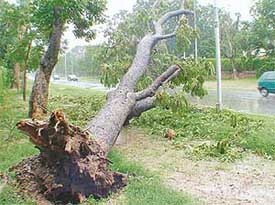 The squall with a velocity of 92 kmph uprooted a number of eucalyptus trees. Most of these trees fell on power supply lines thus disrupting electricity supply to various areas. A silt excluder, which separates silt from water, will be installed at the Sukhna lake to stop the silt from coming into it. The project will be ready by the next monsoon, an official confirmed, while explaining that such silt excluders have been working satisfactorily at various dams. Eight persons, including four women, who had announced to show their dissent against the withdrawal of the Rent Act, were arrested from Sukhna Lake for violating the prohibitory orders under Section 144 of the CrPC. Those arrested included family members of the Commercial Tenants Association activists, including its leader Mr Arvind Jain. The 57th annual conference on immigration laws was held in New Orleans, Louisiana, USA, from June 18 to 22. Organised by the American Immigration Lawyers Association (AILA), the conference was attended by more than 2,500 American immigration lawyers and lawyers from foreign jurisdictions, including Canada, Australia, EEC member states and select South-Asia countries. Come admission time and it is perhaps the principals who feel most harassed. With a virtually never-ending stream of visitors with "sifarish" for getting their wards admission, it is a battle of wits for most college principals in the city. Failing to get the Mayor, Mr Subhash Chawla’s alleged brawl in the Chandigarh Club, discussed in the Chandigarh Territorial Congress Committee (CTCC), Mr Chawla’s opposition camp in the party has raised the issue before the All India Congress Committee (AICC) President Ms Sonia Gandhi and other senior leaders in New Delhi. The Municipal Corporation is considering a proposal to hire a consultant to look into the possibility of making financial gains from its slaughterhouse, by leasing it out to meat processors and exporters that could enhance the returns. The matter will come up for discussion before the Finance and Contract Committee (F&CC) on Monday. The construction of a new link road from Panchkula to Chandigarh, which will also separate two sectors from the slums, is likely to flood hundreds of hutments in the neighbouring Rajiv Colony during heavy showers. The road is being constructed over a channel of a seasonal rivulet flowing between the slum colony and Sectors 17 and 18 here. A view of the breached plinth, which was broken by residents of Rajiv Colony, Panchkula, on Sunday. 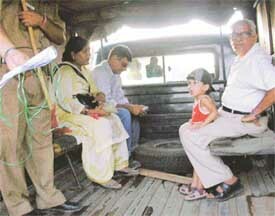 — Tribune photo Pankaj Sharma. The police personnel working on administrative posts will now have to do night patrolling at least twice a month. In a drill held last night to test the new strategy, shortlisted police personnel were asked to set up nakas at different points in the city. The last Shangrila — 2003, a motorcycle expedition to upper reaches of Ladakh, is being organised by the Chandigarh based Team Ocha - Ve Motorcycle Club from August 17 to September 6. Nearly, 60 participants are expected to take part. A 16-day residential camp on personality development, organised by the education wing of the Rashtra Savika Samiti, Punjab, at Sharda Sarvhitkari School, Sector 40, concluded today with a function in which all 180 girls participated. Acharaya Alok Muni has advised police personnel to stay away from bad habits, concentrate on a simple life style, to refrain from the corruption and desist from misuse of power bestowed upon them by law. He was speaking at lecture on moral values held at the Police Lines in Sector 26 here yesterday. The water-table in India is depleting at a fast rate and it is a cause of concern for all of us. Water is the basic need of all human beings. No one can survive without water. Mankind is fully responsible for the depletion of water resources. The main reasons being the cutting of trees, wastage of water while doing daily chores and ignoring leakages from taps and water pipelines. A Punjab Police constable was today arrested by the Chandigarh Police for illegally confining a minor girl in his Sector 38 house. The suspect, Wilson Kumar, was arrested from his native village in Batala (Gurdaspur) where he had gone to cast his vote in the panchayat elections. The Women and Child Support (WCS) unit of the Chandigarh Police has booked a Yamunagar-based family for harassing their daughter-in-law and forcing her to bring dowry. In a complaint to the police, a Sector 18 businessman, Mr Harbilas Mishra, has alleged that Charanjit Singh, a resident of Kajehri village, and Montu Gupta, a resident of Baterla village, duped him by giving a wad of fake currency notes amounting to Rs 5,000. The controversy over the ‘leadership’ of the Panjab University Students Union continues unabated. The group led by Malwinder Singh Kang, the outgoing president of the Panjab University Campus Students Council, claims to have registered the student body saying the rival group were outsiders and had no claim to the party membership. As soon as the first battle of getting admissions to city colleges gets over, another battle of securing a hostel seat begins for students pursuing their education in Chandigarh. It is particularly girls who are the worst hit due to shortage of hostel accommodation in local colleges. Children of sector 46 is defining nature, not with words but with pencil and brush. A workshop conducted by Mr. R S Goraya, Principal of Government Model Senior Secondary School Sector and Sonika Kohli, the Fine Art teacher at the school is giving a chance to the poor students to explore their talent in this field which is absolutely free of cost. 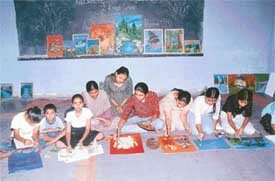 Participants of the painting workshop in action. How well do you read The Tribune? Having studied music for eight years before taking the plunge into the world of popular music, Mandeep Singh Bhullar always wanted to cut his own album. The dream of this city lad finally came true when T - Series approached him for launching a music album. With heavy showers leading to optimum temperature and humidity level for the spread of cholera vibrio, the Health and Municipal Corporation authorities have stepped up surveillance activities in the Vikasnagar area of Mauli Jagran, from where the first cholera case has been reported. 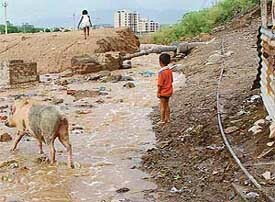 However, the condition in other slum and migrant colonies continues to be deplorable. Keeping your blood pressure well under control to ward off hypertension could be your safeguard against stroke and heart failure, advise doctors. “Those with a blood pressure between 130/80 and 139/89, considered to be border line cases, are twice at risk of developing hypertension, finally leading to stroke,” informed Dr Anil Grover, Head, Cardiology at the PGI, while delivering a lecture on hypertension at a symposium organised here today. Chandigarh lads became the proud winners of the Punjab State Under 19 Inter District Cricket tournament for Dhruv Pandove Trophy, by beating Patiala on the basis of first innings lead here today at the PCA stadium, SAS Nagar today. Dronacharya DP Azad, was the chief guest and gave away the prizes. It was an altogether different kind of experience for more than 100 participants, including children and women, who gathered this morning at the Forest Hill Resort, near Nayagaon, to participate in the ‘Run for Fun’ organised to celebrate Canada Day. The Central Administrative Tribunal (CAT) has issued a notice to the UT Administration, IG Chandigarh Police (IGP) and SSP acting on the original application filed by a UT Sub-Inspector, Mr Bakshish Singh.